Reflecting on the Blues isn’t easy for many. Not because the Blues haven’t been a solid franchise, throughout the now 48 years of their existence; simply stated, it’s because they have yet to win it all. Fans, who have spent so much of their time and emotion following the Blues through the years, are distraught. Former and current players who have put their blood, sweat, and tears into the franchise are left with many sleepless nights…, and many unanswered questions. The Blues are continually scrutinized by a cup hungry fan base that yearns to see an end to what appears to be an endless drought. The Blues are the only initial expansion team left that hasn’t held Lord Stanley. In more recent history, the best chance at a cup for the Blues was in 1996. This is the year, however, of the infamous Nick Kypreos collision with Grant Fuhr that ended his season. 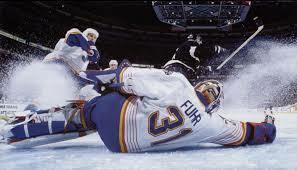 Though St. Louis defeated Toronto, they ultimately lost to the Detroit Red Wings and Grant Fuhr was never the same. Other years are filled with what many disappointed fans call excuses. Looking at the history, one cannot really argue with this sentiment. A lack of defense, a lack of depth, a lack of scoring, a lack of intestinal fortitude, a lack of goaltending; and so the drought continues. Year after year, has culminated into what has become an eyesore for this franchise that has won 8 Division Titles with 38 playoff appearances. There are so many ‘NHL stars’ that have placed the “Blue Note” on their chest, and to no avail. Stars that include Glenn Hall (67-71), Jacques Plante (68-70), Brian Sutter (76-88), Bernie Federko (76-89), Michael Liut (79-85), Brett Hull (87-98), Al MacInnis (94-04), Wayne Gretzky (95-96) and many more. In the Blues first few years of existence, with Scotty Bowman at the helm, the Blues lost in the Stanley Cup Finals his first three years (67-70) consecutively, and have yet to return. After being knocked out of the playoffs for a fourth consecutive season, Bowman and the Blues parted ways in 1971. 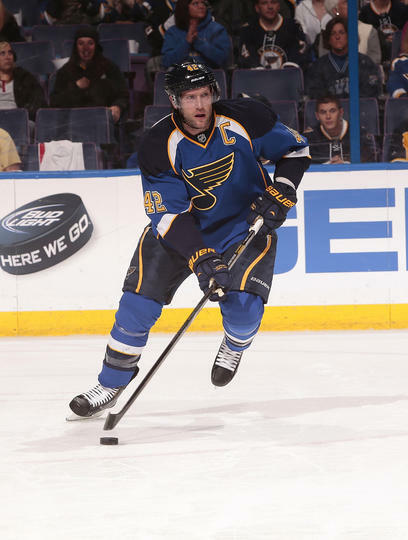 The Blues also rank 3rd all-time with 25 consecutive years in the playoffs from 1979-2004. Most recently, the Blues have made the playoffs the last 3 years in a row, all resulting in the same outcome and a furious fan base left telling themselves, once again, “maybe next year.” Reviewing the history, one can understand why there’s so much frustration for an organization so beloved. Pressing forward to this current season, the Blues sit amongst the top in the NHL with 62 points through 46 games. Their success comes in goals for (144), which currently ranks 3rd in the NHL. The Blues power play currently (25.5%) ranks 1st in the NHL. Another highly successful aspect of the Blues game is goaltender Brian Elliott. 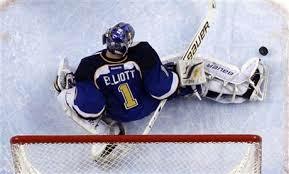 Elliott ranks 1st in GAA, with a 1.86 and 4th in save percentage, at .930. Regardless of the stats, goaltending continues to be a heated topic amongst fans, concerned that Brian Elliott isn’t the answer. There are those that contend Elliott plays too far in the crease, that he’s too inconsistent when the games on the line, and that his glove hand is far too slow. Whether you believe in Elliott as the number one or not, it truly is hard to dispute how well he has played since arriving in St. Louis. Since his arrival in 2011, he ranks 1st overall in franchise history, with a save percentage of .927 and a minuscule 1.87 GAA. Where fans do not find issue with goaltending, they shutter at a defense whom relies more upon finesse, than the hardnosed play as seen in previous years. The Blues currently rank 22nd in hits at 936. The Blues have also allowed a plethora of odd man rushes into their defensive zone; that at times leaves the goaltender to fend for themselve’s. The Blues have a league leading plus/minus 25 at home, but on the road they currently rank 15th in plus/minus with a -1. This is quite the differential for a club that is considered to have some of the best defensive pairings in the NHL. As noted, the Blues are a team with quite the history. They’ve been among the top in the league many times, but have failed to take it all. This is a team that leaves fans on a high one moment, only to shake their heads the very next. There is a decade’s long obsession with the “Note” and with the players that have come along the way, wearing it. Fans have grown up loving the tradition to “Bleed Blue” while raising their kids to do the very same. This current team has the makeup, once again, as a Stanley Cup contender. A Captain in David Backes; whose toughness and leadership, few can emulate, along with a team that is unstoppable when they play their game. Questions still remain for a fan base that continues to rely heavily on the notion, that the dreams of seeing the Blues raise the cup, will someday come true. So is this the year we see magic on the ice? Or are the Blues simply destined to leave the ice once again haunted by the question…, did we really leave everything out there on the ice?